Sharp Multifunctional MFPs, printers and copiers - quality and excellence. Sharp multifunctional MFPs and printers are designed to make device setup easier and faster. These are not your typical all-in-one copier, printing, faxing and scanning devices. Precision engineered to help increase workflow efficiency and provide exceptional image quality, Sharp MFPs are easier to operate, control, monitor, manage and maintain, helping take your business to the next level of productivity and performance. For years, Sharp document products and solutions have been earning high praise and prestigious awards from leading MFP testing organizations. For Sharp, this represents more than just an accumulation of accolades. It means that trusted industry experts as well as customers, recognize that the remarkable innovation, user-friendly design, outstanding reliability, unsurpassed security, and boundless expandability of Sharp digital MFPs and copier/printers, truly exemplify the company’s unwavering commitment to quality and excellence. 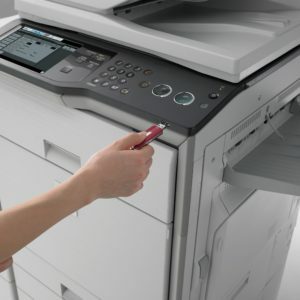 The Sharp multifunctional printer (MFP) user interface lets you edit your business documents, drag and rearrange files all with the slide of a finger. The 10.1″ color LCD touch control panel is customized to meet your printing, copying, faxing and scanning needs. Sharp offers applications that help you distribute scanned documents, integrate with an existing workflow, control hard copy costs, keep your information confidential and remotely manage your multifunctional printer devices. Sharp OSA technology is a software development platform for Sharp MFPs. It delivers integrated and customized interfaces which help streamline your business processes. Sharp OSA technology can transform your MFP into a powerful information portal. This provides fast and extended access to mission critical business information while your IT network and security policies are maintained. Sharp remains the highest rated company in validated MFP products. Sharp is regarded as one of the industry’s greatest security innovators. Businesses and government agencies worldwide have come to depend on this level of assurance, which Sharp pioneered and for which it continues to set the benchmark.